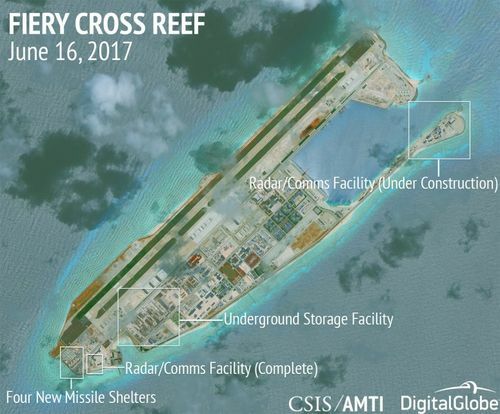 New satellite images show that China has added reinforced launch sites for illegal surface-to-air missiles on at least three of China's illegal artificial islands in the Spratly Islands: Fiery Cross, Mischief Reef and Subi Reef. While unarmed launch sites are not, by themselves, a danger to anyone, they are one step away from armed launch sites. In December, China moved SA-21 anti-aircraft missile batteries with a 250-mile range to the island province of Hainan for training. For the time being, they remain inside China, but could be moved outside China to the illegal military bases in the South China Sea, where they could be used to target any aircraft, including American unarmed surveillance flights. China has claimed the entire South China Sea as its sovereign territory, and has built artificial islands and military bases. However, these claims and activities were declared illegal in a ruling by the United Nations Permanent Court of Arbitration (PCA) in the Hague, in a case brought by the Philippines. So all of these activities by the Chinese are in violation of international law, although the Chinese don't care about international law except as it applies to the West. Furthermore, China promised in 2014 that the artificial islands would not be used for military purposes. That was obviously a lie, and in fact any promises that Chinese officials make can be assumed to be lies, as has been shown this week by the situation in Hong Kong. On Sunday, an American warship, the USS Stethem, sailed within 12 nautical miles of Triton Island, which is part of the Paracel Islands in the South China Sea. Triton Island is clearly in international waters, and the Stethem was performing a "freedom of navigation operation" (FONOP). These operations have been going on for years in order to defy China's illegal annexation of the South China Sea, and to establish that the South China Sea is international waters through which any ship may pass. However, China launched a protest, claiming that the Stethem violated its sovereignty. "Under the pretext of ‘freedom of navigation,’ the US side once again sent a military vessel into China’s territorial waters off the Xisha [Paracel] Islands without China’s approval. The Chinese side strongly urges the US side to immediately stop such kind of provocative operations that violate China’s sovereignty and threaten China’s security. The Chinese side will continue to take all necessary means to defend national sovereignty and security. China dispatched military vessels and fighter planes in response to warn off the US vessel. The Chinese side is dissatisfied with, and opposed to, the relevant behavior of the US side." China actually has no sovereignty to be "violated" in that region, as the United Nations Hague Tribunal has ruled, but Chinese thugs do what they want irrespective of international law. During his speech on Saturday at the 20th anniversary of the handover of Hong Kong from Britain to China, China's president Xi Jinping made the claim that the "One Country, Two Systems" was still in effect, meaning that Hong Kong residents still had freedom of speech free elections, press freedom, and an independent judiciary. The claim is laughable, as we reported two days ago. In 2014, Beijing thugs triggered the anti-Beijing "Umbrella Movement" by blocking any future free elections. In 2015, Chinese thugs kidnapped five Hong Kong booksellers who had published material critical of Beijing's leadership. And just as Xi Jinping was making his laughable claim that "One Country, Two Systems" is still in effect, the Beijing foreign minister announced that it was repudiating the agreement with Britain that had described the "One China, Two Systems" agreement. Hong Kong police have been harassing and jailing pro-democracy demonstrators all week, making sure that no freedom of speech will be permitted. "Any attempt to endanger national sovereignty and security, challenge the power of the central government and the authority of the Basic Law of the HKSAR (Hong Kong Special Administrative Region) or use Hong Kong to carry out infiltration and sabotage activities against the mainland is an act that crosses the red line, and is absolutely impermissible."